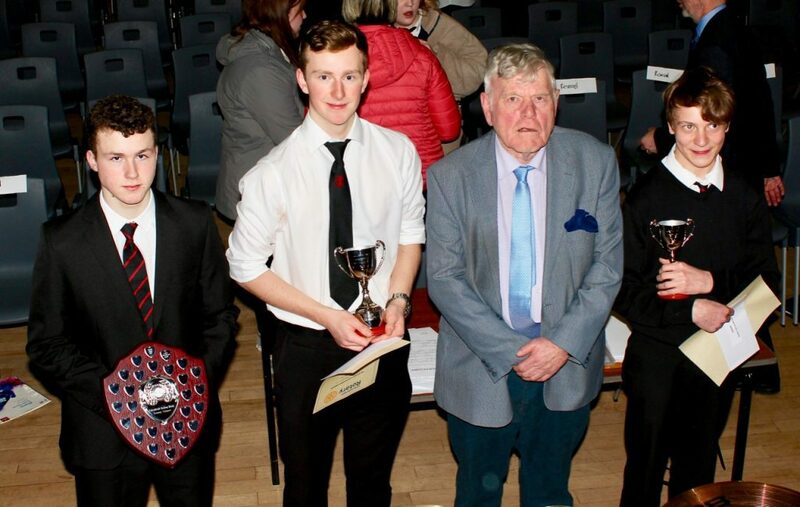 The annual Kirkcudbright Academy Rotary Young Musician Competition was held in the Cochran Hall last Friday. Once again the event proved to be a great success. The audience of teachers, families, friends, fellow participants and Rotarians were treated to a really entertaining concert by Kirkcudbright Academy students of all ages. Each of the 26 young musicians taking part set out to be crowned as best musician or best vocalist of 2019. All competitors performed with great confidence and evident enjoyment that served to enhance their performance. The winner of the Junior Competition was Micah Boland who played ‘Crooked’ on drum kit. The winning vocalist in the senior section was Luke Thomson singing ‘Shenandoah’. The winning instrumentalist in the senior section was John Rodger with Chopin’s piano ‘Nocturne in Eb Major’. John expressed his delight at winning the competition this year and was particularly anxious to thank those who have helped him achieve such a high standard. “I’m absolutely delighted to have won after several years trying’’ said John. ‘’I must offer a big thank you to Miss Gill, my music teacher at Kirkcudbright Academy, and to my excellent piano teacher, Angela Lawrence”. All the winners, runners up and those in third place received cash prizes from Kirkcudbright Rotary Club whilst all those taking part received certificates from Rotary to mark their contribution to the evening. Both John and Luke will now proceed to the Rotary South West Scotland final at Annan Academy on Thursday 14th February. The competition was judged by Jamie Brand and Georgina Pryde-Firmin, from the Music Department at Annan Academy. Jamie commented both on the high standard of the performances as well as the confidence the young people showed. Jamie and Georgie were thanked for the unenviable task of judging the performances on the night and presented with gifts of appreciation. 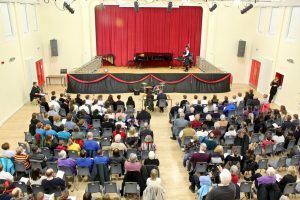 It was commonly acknowledged by the young people and their parents that the performances on the night could only have been achieved due to the commitment, leadership and inspiration of a dedicated teacher, Miss Hannah Gill, music teacher at the Academy. Stuart, who had earlier played ‘New Orleans Nightfall’ on the piano, presented Miss Gill with a bouquet of flowers and spoke in very well chosen and sincere words about the inspiration she had been to him and fellow students. The Concert was huge success and enjoyed by everyone in the audience.